Catherine Constance: Teddy did it. . .
Just gorgeous. It is always lovely to hear the story behind the picture! Cute illustration - love it! You deserve that award. You're so inspiring! oooh, she's cute - reminds me of my little Saylor PUP! i am sorry to hear you are sick, take care my friend! ahhh, get better soon, I love this work, the the story and the art, just perfect! Oh how cute!!! I guess teddy was a bit naughty. congratulations on your loving followers! and i wish you health and vitality... soon! your illustrations are precious. love the attitude on teddy with his hands (paws?) on his hips! Hope you feel better soon! Love, love, love your super cute picture... those bears, though, always up to no good! Your illustration is so beautiful!! Very cute! Sorry to hear that you are sick, hope you get well soon. Aw what a mean teddy.... good thing he's cute! Sorry to hear you're under the weather. I am too. Feel better. Teddies get away with murder lol. I hope you feel better soon! Your illustration is fantastic. Sorry you have a sick tummy! It has bee a while since I've participated on SS and WOW!!!!!! Your work has come so far since my last visit. I absolutely adore your great little characters. I like the way you did her hair. Her shoes and posture are very cute. Teddy attitude is GREAT! I like the sketchiness of his fur. 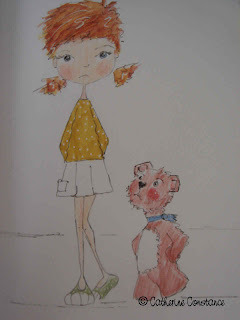 Loving your newsprint creations in earlier posts and this sweet girl too..though naughty for eating all those biscuits! 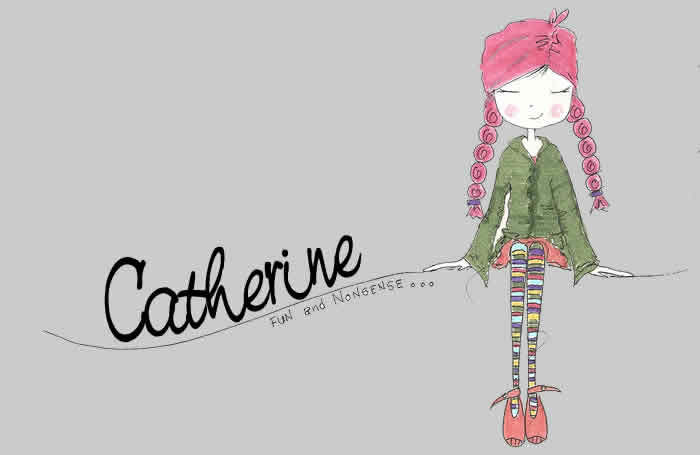 Oh so cute, Catherine. I'm loving each and every one of your characters. :) Hugs! this is so adorable! i love the story that goes with it!